The new incinerator in Poland will process 94,000 tonnes of mixed waste from the region of Konin a year. The entire process is auto-thermal, so that no additional source of heat is required. The plant's largest facility, the bunker, is 45 m high of which 12 m are underground. First, light COMAIN panels were assembled for the forming of the foundation slab. The next step was done at the bottom of the building. 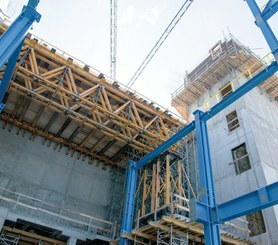 The 2.65 m high walls were built with SMK trusses and 2.70 m high ENKOFORM V-100 beam-based formwork panels. 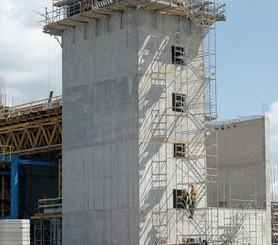 The tallest walls were built with BMK climbing brackets supporting 5.4 m high ORMA formwork gangs. Due to the system's efficiency regarding costs and time, it could be reused for the walls of other facilities. The slab dimensions required high load-bearing capacity shoring. This was accomplished by MK and T-60 shoring reaching up to 18 m height. Interferences between parallel works required special solutions. The shoring of the pier cap and of the roofing formwork overlapped with the fitting of a steel structure. ULMA designed a shoring system with MK-360 at a maximum height of 11.5 m and four 2.5 m high MK trusses spanning over 12.5 m. For load transfer from the top slabs between the 4 towers, profiles were placed on the MK trusses. Utmost flexible, light, crane-independent formwork. Ideal for walls, columns, beam sides and foundation construction. Truss based formwork for single-sided walls up to 10.5 m. Configurable and compatible with all ULMA wall panels. Highly flexible crane-lifted climbing system, adaptable to inclined and curved walls. Minimum transport volume. 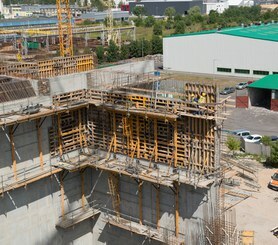 Modular formwork system for the construction of any vertical concrete structure. Highlights: high performance rates at minimum labour cost. The ultimate heavy duty shoring tower for civil engineering constructions. Highlights: few components for multiple shoring configurations, quick and safe on-site erection. Cost-effective shoring tower specially oriented for bridge construction and specific applications in industrial and building constructions.